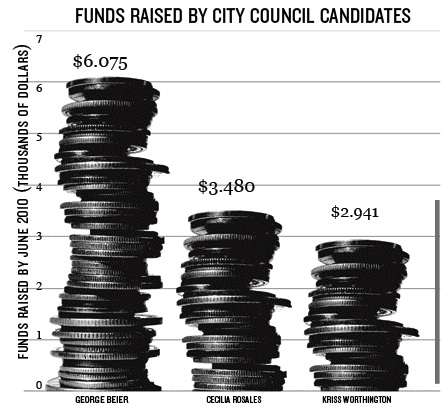 As the three-way race for the Berkeley City Council District 7 seat speeds up, candidates have raked in an abundance of contributions, and despite the thousands of dollars that separate them, the candidates agree money is not the key to success in this election. Within the first filing period - which covers contributions received from Jan. 1 to June 30 - George Beier received the most contributions, totalling $6,075, while Cecilia Rosales and the incumbent, Councilmember Kriss Worthington, raised $3,480 and about $2,942 respectively, according to campaign disclosure statements. "We expect (Beier) to have the most money throughout the entire campaign," Worthington said. "I wouldn't dream of putting as much money into the campaign as he's done before and that he's going to do ... He already is the biggest money candidate and he will be the big money candidate throughout the campaign." Districts 1, 4, 7 and 8 - occupied by incumbents Linda Maio, Jesse Arreguin, Worthington and Gordon Wozniak, respectively - are up for the Nov. 2 elections, which have already heated up in the seventh district, though the nomination period ended less than two weeks ago on Aug. 6. "George has run twice before and lost, so I think he figured if he puts even more money and starts earlier, that might change the results," Worthington said. "But he had the biggest amount of money last time." Beier, who has been endorsed by five council members, Mayor Tom Bates and former Mayor Shirley Dean, said his campaign has "a broad base of support," adding that his list of campaign contributors - including 39 individuals by June 30 - is mostly composed of Berkeley residents. "It reflects my commitment to the community," he said. "We're very much running a neighbor-to-neighbor campaign." In 2006, Beier and Worthington raised $106,387 and about $46,281 respectively during the election year. Worthington narrowly beat Beier by a margin of about 200 votes that year. "(Elections) are more likely to be won doing the hard work of talking to the voters and letting them know where the candidates stand," Worthington said. "In Berkeley, a grassroots activist like me has a chance." He added that although Beier's advertising at his headquarters - located at 2599 Telegraph Ave. - has caught voters' attention, his "massive resources" will not win the election. While Beier has hired campaign consultants and six unpaid student interns, Worthington and Rosales have been focusing on recruiting volunteers. "I am relying on just doing the hard work and doing what I can do," said Rosales who has at least 20 volunteers so far. "I doubt that money alone will be the determining factor as to who wins or loses in this campaign." Beier said he has learned from previous campaigns to allow others around him to do some of the work. "I surround myself with really smart people, and I let them do the work," Beier said, adding that his campaign is a team effort. "I focus on raising money and meeting people." While campaigns inherently cost thousands of dollars, Beier, Rosales and Worthington agreed the election cannot be bought. "People place too much emphasis on money in campaigns," Beier said. "The heart of the candidate wins campaigns ... Unless you have the right heart you cannot win, and it's my obligation to show my heart to those supporters, and I don't think any amount of money will do that." Clarification: An earlier version of this article may have implied that Candidate George Beier was paying both political consultants and six student interns. Only the two consultants are being paid, the six students are volunteers.